Cardinal Fuzz has become one of my favourite record labels of recent times – they seem as concerned with a high quality of finish and design on their releases as I think any label should be, and their records all spin around the axis of noisy, guitar-based psychedelic/experimental music. Win, and indeed win. 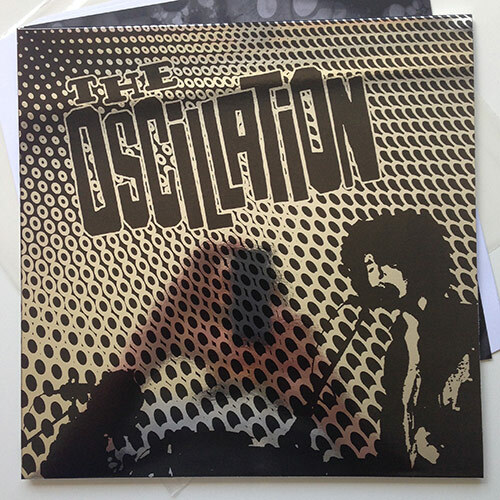 Cable Street Sessions is a new 12″ by The Oscillation, who have here four pretty intense, pretty aggressive repeato-fuzz pieces that include a cover of The Deviants’ ‘Somewhere To Go’. They’re a superb live band – I’ve put them on a couple of times before as part of the festival I co-run, and never not been impressed. They’ve also got some interesting connections – drummer Valentina Magaletti has been in about 15,000 bands in the past, and has been a name that consistently crops up as one makes one’s way around the independent music world; bass player Tom Relleen is also an excellent booking agent (one of the good guys in an industry that seems increasingly full of… not-so-good guys). A designer isn’t credited either on the sleeve or the insert that comes with this record; although the photography on both is by Anita Awbi. It’s a fun design, with the heavily treated cover photograph psych-ed up with its repeated distorted circle motif, and typography that shifts things in a slightly gonzo/punk direction. And, of course, it’s printed onto reflective mirror board, to up the stakes in terms of shininess and can’t-take-a-photograph-without-accidentally-doing-a-selfie-ness. (It also reminds me of The Verve’s A Northern Soul album packaging, which was similarly reflective). “Some of the heaviest and best kraut-a-delic music out there…” says the label’s website about this record. They’re not far wrong.